Most parents want their children to succeed – a good education is vital in securing opportunities in adulthood. If a school can improve attendance by 1%, they will see a 5-6% improvement in attainment (Department for Education). Maybe, but that missing 10% actually means half a day missed every week. No employer would be happy with that! The Department for Education research suggests that 17 missed school days a year can mean a whole GCSE grade DROP in achievement. The greater the attendance the greater the achievement. That’s a fact! Whenever a child is absent from school the parent should on the first day of absence contact the school with an explanation. We need to know as soon as possible. Occasional Absence – occasional school absence can rapidly build up. Try to stay strict on even infrequent absence, and show your child that attending school is a priority. You Are Not Alone – talk to us, we may be able to help support you and your child. 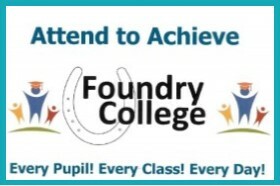 Please click here to view our full Attendance Policy.